Battle of Gettysburg Day 1 – What Is This? 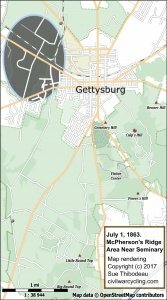 This is a deliberately terse and dense summary of the Battle of Gettysburg Day 1 – July 1, 1863. 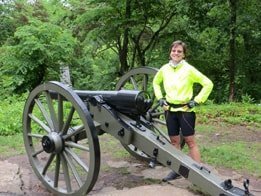 You are reading my study notes — re-cast as sentences — from multiple bicycling adventures in Gettysburg National Military Park. 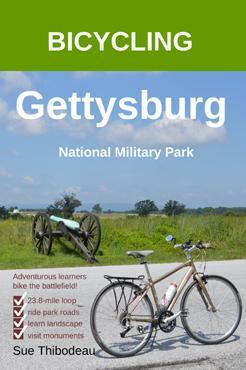 I am using these and other notes to study for the Licensed Gettysburg Battlefield Guide Exams. On the other hand, for something more basic than these notes on the Battle of Gettysburg Day 1, please refer back to Battle Summary – Prelude (under July 1) and the Civil War Trust’s animated map of the Battle of Gettysburg. These terms mean basically the same thing. The Union is the United States of America (USA) — the state governments that did not secede from the federal government. The states that remained in the Union are also called The North. 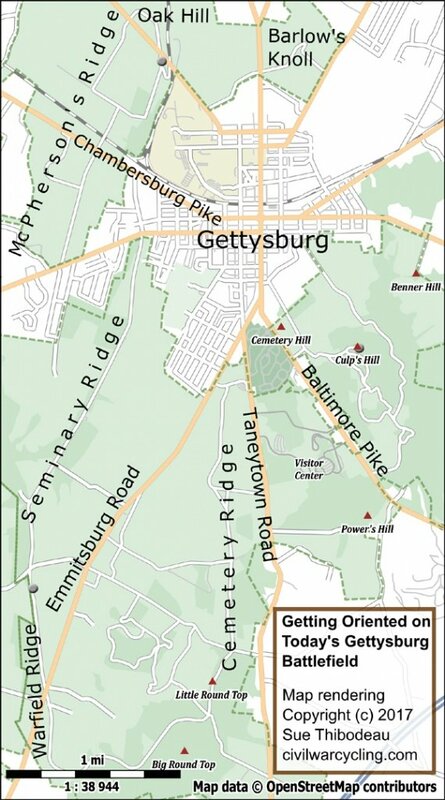 One Union army fought at Gettysburg, the Army of the Potomac (AOP) under Maj. Gen. George G. Meade. Similarly, the Confederacy is another name for the Confederate States of America (CSA) — the state governments that seceded from the federal government to form a new government separate from the United States. The states that seceded are called The South. 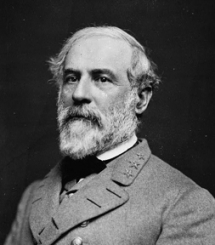 One Confederate army fought at Gettysburg, the Army of Northern Virginia (ANV) under Gen. Robert E. Lee. The South attacked from the north and The North attacked from the south. The terms left flank and right flank also confuse many new history students. A flank is the end of a military battle line. The concepts of right and left are always relative to the direction that a particular army is facing on the battlefield. When two armies are facing each other directly, one army’s right flank is the other army’s left flank, and vice versa. If you take the time to understand this without glossing over your reading, a great fog is lifted! 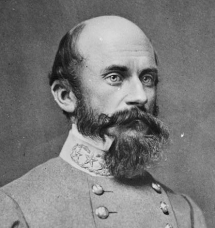 The following portraits are a representative sampling of the highest ranking Federal (Union) and Confederate officers whose units fought on July 1. For a more complete (but still high-level) listing, please click here. To read an officer’s name, hover over (or touch and hold) the image. Most images are from the Library of Congress (LOC). 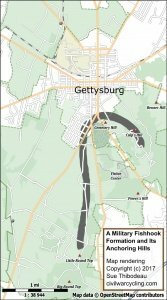 The Battle of Gettysburg pitted the Army of Northern Virginia (ANV) under Gen. Robert E. Lee against the Army of the Potomac (AOP) under Maj. Gen. George G. Meade. It began in the morning, in northwest Gettysburg, and moved southeast through Herr’s and McPherson’s Ridges. 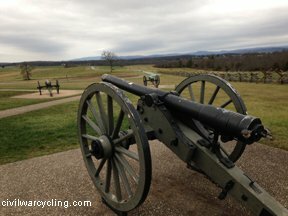 In the early afternoon, the battle spread north and northeast of Gettysburg. The Confederates came from the north, the Federals from the south. McPherson’s Ridge at South Reynolds Avenue. We are looking northwest to McPherson Barn. 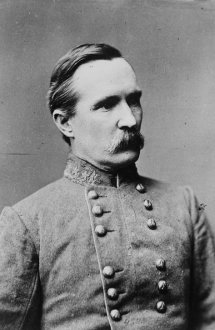 For several hours in the morning, Union Maj. Gen. John Buford’s 1st Corps cavalry held off Confederate Maj. Gen. Henry Heth’s infantry division of A. P. Hill’s corps. 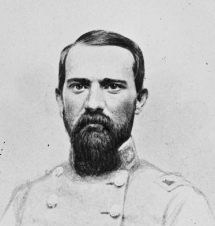 Not long after the 1st Corps infantry arrived to relieve Buford, however, 1st Corps commander Maj. Gen. John F. Reynolds was killed. Reynolds was the highest ranking officer from either army to die at the Battle of Gettysburg. When Confederate Maj. Gen. Robert E. Rodes’ division arrived from the north (at Oak Hill), the battlefield area was enlarged to include the farmland north of town. Although Rodes’ division was twice the size of Union forces under Doubleday, Wadsworth, and Robinson, the Confederate attack was repulsed. By early afternoon, the battlefield grew to include the area east of Oak Hill. Union Maj. Gen. Oliver O. Howard’s 11th Corps squared-off with Maj. Gen. Jubal A. Early’s division in the Blocher’s (now Barlow’s) Knoll area. This was the Union right flank. The line broke. 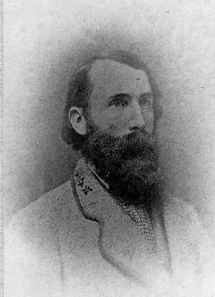 As fighting intensified to the west (and Confederate Maj. Gen. William Dorsey Pender joined the battle), the Union left flank also broke. In the late afternoon, Union soldiers retreated through the town of Gettysburg. They were covered by Col. Charles R. Coster’s (11th Corps) brigade of New Yorkers and Pennsylvanians, who fought hand-to-hand against their Confederate counterparts in Early’s division. Earlier in the day, Howard had left an infantry brigade and artillery support on high-ground south of town, known as Cemetery Hill. The Army of the Potomac retreated to this location. Lee had instructed Early’s corps commander, Lt. Gen. Richard S. Ewell, to “take that hill if practicable,” but Ewell judged that it was not practicable. The fighting had ended for the day. Through the night, reinforcements from both armies arrived in Gettysburg. The Union line extended on the right from Culp’s Hill to a bend around Cemetery Hill to the west and then due south along Cemetery Ridge to Little Round Top. It resembled the shape of a fishhook, as illustrated in the drawing that accompanies this text. The Confederate line wrapped around the Union line (with gaps). The Confederates occupied the town. 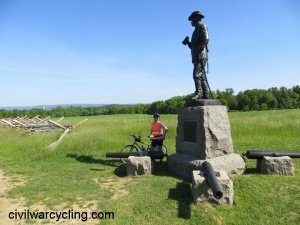 This cheat-sheet on the “Battle of Gettysburg Day 1” summarizes common knowledge that I drew from several sources; see Civil War Cycling’s Gettysburg Reading List. I relied heavily on two books by Bradley M. Gottfried. One was The Maps of Gettysburg (New York: Savas Beatie, 2010) and the other was Brigades of Gettysburg (New York: Skyhorse Publishing, 2012). All mistakes are mine. At about 7:30 A.M., the first infantry shot was fired. Confederates attacked the ridges to the northwest of the town of Gettysburg. Around noon, the Confederates attacked from Oak Hill, where McPherson’s Ridge and Seminary Ridge converge. The Union 1st Corps ultimately retreated. Around 2:30 P.M., two Confederate brigades under Jubal A. Early arrived from the northeast and attacked at Blocher’s (now Barlow’s) Knoll. The Union 11th Corps line collapsed. 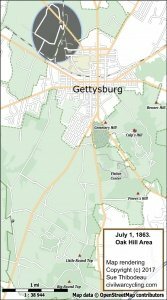 Battle of Gettysburg Day 1 – The battle begins in the morning in northwest Gettysburg. Confederate infantry pressed southeast toward Gettysburg along the Chambersburg Pike. At about 7:30 A.M. on Wednesday, July 1, 1863, Confederate Gen. Henry Heth’s division attacked Union Brig. Gen. John Buford’s cavalry. Second Lieutenant Marcellus Jones of the 8th Illinois Cavalry is credited with firing the first shot of the battle. The first Union casualty for the day was Pvt. John E. Weaver of the 3rd Indiana Cavalry. McPherson’s Ridge at the John Buford Statue on Chambersburg Pike. Buford is looking west at the Confederate army’s approach. According to historian emeritus of the National Park Service, Edwin C. Bearss, the Protestant Reynolds had a secret fiancée — a Catholic woman named Kate Hewitt. She had in her possession Reynolds’ West Point class ring. Kate had pledged to become a nun if Reynolds died; after Reynolds’ burial, she fulfilled her promise. Reynolds was shot in the neck and died instantly in Herbst Woods (now called Reynolds’ Woods). 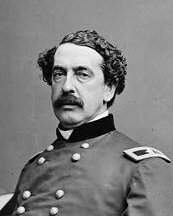 It was now late in the morning, sometime between 10:00 and 11:00 A.M. Maj. Gen. Abner Doubleday assumed command of the 1st Corps, Army of the Potomac. Edwin C. Bearss, Fields of Honor: Pivotal Battles of the Civil War (Washington, DC: National Geographic Society, 2007), p. 161. Battle of Gettysburg Day 1 – The Confederates arrive at Oak Hill around noon. Around noon on July 1, Maj. Gen. Robert E. Rodes’ division of Ewell’s corps held the high-ground on Oak Hill. From here, Confederate artillery and infantry attacked Union 1st Corps positions to the south and southeast. The 1st Corps was led briefly by Maj. Gen. Abner Doubleday, who replaced Reynolds until the higher-ranking Oliver O. Howard arrived to fulfill Reynolds’ role as Wing Commander. Confederate Cannon on Oak Hill. McPherson’s Ridge is on the right. The cannon is pointing southeast toward Doubleday Avenue. Under the divisional leadership of Brig. Gens. 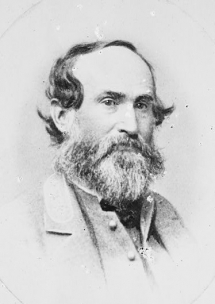 James S. Wadsworth and John C. Robinson, the Confederate attack was repulsed. Monuments along Doubleday, Wadsworth, and Robinson Avenues mark regimental positions of the Union army before the Union line broke in the late afternoon, when both the 1st and the 11th Corps retreated south through the town of Gettysburg. 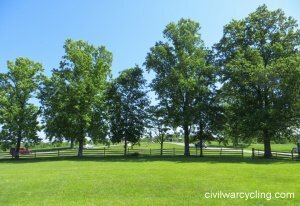 Battle of Gettysburg Day 1 – The Confederates arrive at Barlow’s Knoll after noon. 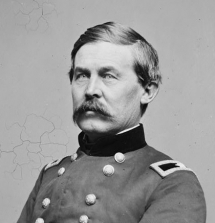 Maj. Gen. Jubal Early’s division of Ewell’s corps attacked Howard’s 11th Corps at Barlow’s Knoll, northeast of the town center. Lee called the notoriously short-tempered Early his “Bad Old Man.” After the Civil War, Early was a vocal advocate of the Lost Cause movement. Howard commanded the Union 11th corps. At Gettysburg, Howard fought without his right arm, which was amputated after the Battle of Fair Oaks in 1862. Badly beaten by “Stonewall” Jackson at the Battle of Chancellorsville in May (1863), Howard and his 11th corps of mostly German immigrants had earned a poor battlefield reputation. A devout Christian from New England, Howard opposed slavery and would work to advance the labor and voting rights of freed African Americans after the war. In his role as wing commander for the Union 1st and 11th Corps, Howard delegated right flank operations to Brig. 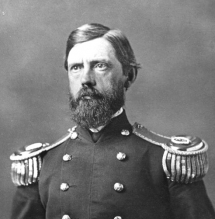 Gen. Francis C. Barlow, a thirty-year-old Harvard-educated lawyer. Barlow decided to anchor the Union right flank on this modest hill (called Blocher’s Knoll at the time) while Howard attended to the left flank. 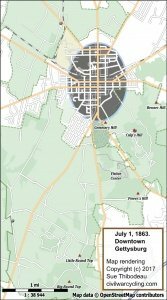 In the early afternoon of July 1, Early’s division flanked and soundly defeated Barlow’s division. One young Union soldier who wouldn’t make it out of Gettysburg alive was Buffalo native Lt. Bayard Wilkeson, age nineteen, commander of 4th U.S. Artillery Battery G. His aunt was the famous suffragist, Elizabeth Cady Stanton. Wilkeson died in a nearby field hospital from wounds sustained in Barlow’s Knoll, where his right leg was nearly severed by cannon fire (and legend has it that Wilkeson amputated his own leg with a pocket knife). Barlow’s Knoll. We are standing at a Union position, facing north toward the Francis Barlow Statue at a bend in Howard Avenue. Scott Scalon, “Buffalo lieutenant gave his life for honor at Gettysburg,” The Buffalo News, July 1, 2013. 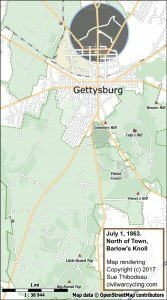 Battle of Gettysburg Day 1 – The Union army retreats through town. In the late afternoon, the Union line collapsed. The Union left finally buckled when Confederate Brig. 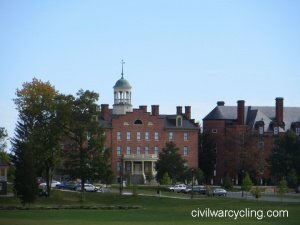 Gen. William “Dorsey” Pender drove 1st Corps troops out of Seminary Ridge at around 4:00 P.M.. The Union right buckled from the north, at Barlow’s Knoll, after being flanked by Maj. Gen. Jubal Early (Ewell’s corps). The 1st and 11th Corps poured south through town to establish a new battle line anchored at Cemetery and Culp’s Hills. Cemetery Hill had been secured earlier in the day by Brig. Gen. Adolph von Steinwehr (2nd division, 11th corps), on order of Maj. Gen. Howard and supervised by Maj. Gen. Carl Schurz, who was technically the 11th Corps Commander while Howard filled-in for Reynolds as wing commander. Modern-day Steinwehr Ave is on the west slope of Cemetery Hill. Neither Steinwehr nor Schurz are otherwise memorialized at Gettysburg. 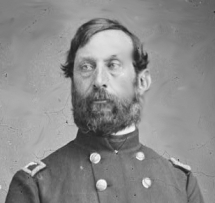 Notably, though, Schurz had served under Lincoln as Ambassador to Spain. In 1869, he became the first German immigrant to serve in the U. S. Senate. Although Union soldiers would make it to the hills of southern Gettysburg, the retreat was not without chaos and gunfire in the streets. Col. Charles Coster’s Brigade stalled the Confederate advance by fighting in the Kuhn brickyard (where Sgt. 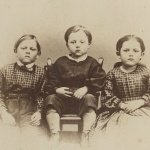 Amos Humiston died clutching an image of his three children). A memorial to Humiston on South Stratton Street (south of Coster Avenue) is the only monument at Gettysburg dedicated to an enlisted man. On the Confederate side, Longstreet’s Corps did not fight on July 1. Both Longstreet and Lee were about eight miles northwest of Gettysburg, in Chambersburg. They arrived in Gettysburg later in the day on July 1. On the Union side, Meade arrived in Gettysburg in the early (pre-dawn) hours of July 2. The bulk of the Army of the Potomac would arrive in time for fighting on July 2. 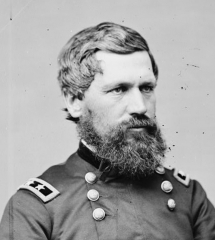 One Corps Commander, Maj. Gen. John Sedgwick had a grueling thirty mile march from Maryland to Gettysburg. His troops were the last to arrive. Charles Teague, Gettysburg By the Numbers (Gettysburg, PA: Adams County Historical Society, 2006), 18. Source: Noah Andre Trudeau, Gettysburg: A Testing of Courage (New York: Harper Collins Publishers, 2002), p. 272. Gettysburg’s Lutheran Seminary. The cupola offers an expansive view of the area. By the time the dust settled on July 1, Lee was inspecting the strong Union defensive line from the cupola of the Lutheran Theological Seminary. Battle of Gettysburg Day 1 Results: A Confederate victory.